The Moogle, for those who do not know it is a small creature that dwells in the realms of the Final Fantasy Games (amongst others). Their name comes for an amalgamation of the Japanese words mogura (mole) and kōmori (bat). Moogles have small eyes and red, pink, or pur-ple bat-like wings. A single black antenna sticks up from their heads, with a small colorful ball (usually red or yellow or blue) at the end called a “pompom”. Their ears are usually shaped like a cat’s and their fur is white or light pink. Add to this the fact that Moogle is my daughter’s nickname for me, what else could I design! For those of you that are unfamiliar with the technique of intarsia in the round there is an excellent tutorial here. 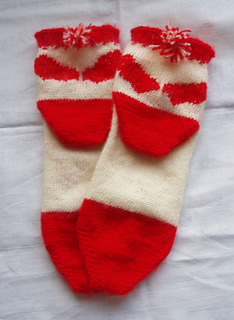 If you really hate intarsia you can always use duplicate stitch to create the design.